Ketan and I are tied to each other in some hidden way. Our friendship, however, never developed the natural closeness one might expect to develop between two people who had had so many shared experiences together. Over the coming years, we would live together for a time, work together, do selfless service together, socialize together and often relax together. Had you seen us during those years, you might have expected us to be the closest of friends. But we weren’t close in that way, not in the way I had once imagined friends should be. In some ways, I’m reminded now of David Moretti, my best friend from grade school. After leaving the Center, I met up with Dave a few times. As kids, we had shared many experiences together and had bonded as friends. As adults, however, the passage of time had changed things. We had grown apart and the shenanigans of our youth which had bound us together as kids were no longer enough to hold an adult friendship together. That’s the sort of dynamic I felt with Ketan. Almost from our first meeting on the tennis court that August 1983, I felt a bond with him -- a bond from long ago. It was as if we had known each other before. But minor personality conflicts between us, however, prevented that old friendship from budding once more. Instead, from the time I met Ketan, I thought of him more as a younger brother than as a friend. While we might not have always gotten along and, perhaps, weren’t “best friends forever,” Ketan and I were blood close and I would have done anything for him. 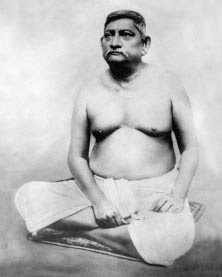 Ketan’s faith in Guru was unique amongst the disciples. His wasn’t blind faith -- a trusting hope in Guru. Ketan’s faith was synonymous with knowledge. He knew who Guru was in a way that few disciples did. I'm not describing here intellectual knowledge, but rather occult knowledge -- a "knowing." That knowledge served Ketan as an internal compass that permitted him to safely navigate the very boundaries of Center life and then return home again with a better understanding of himself and the world. I left the Center some 18 years ago. As a result, my contact with Ketan has been limited since then. Not long ago, though, I dreamt of him. In my dream, Ketan and I were at a function and Guru placed a sash of some kind -- a symbol of recognition -- around both of our necks and then told those present that he wished that all disciples could be both with him and for him like Ketan and me. Guru then moved to an elevated chair, like upon a stage, and I moved closer to get a good seat. Ketan, however, moved to the side of the room. He had tears in his eyes as I tried to beckon him over to sit next to me, but he wouldn’t come. Ketan and I are tied to each other in some hidden way. I hope that someday, that bond will bring us together once again. 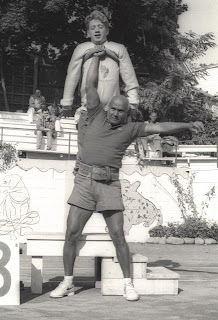 The great picture of Guru lifting Ketan was taken by Ranjit, whose gallery can be found here.